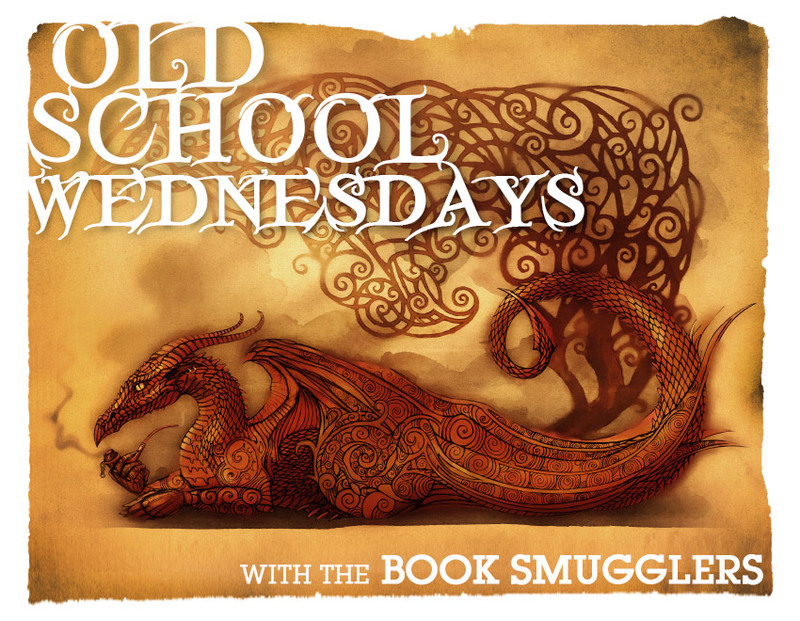 Old School Wednesdays is a regular Book Smuggler feature. We came up with the idea towards the end of 2012, when both Ana and Thea were feeling exhausted from the never-ending inundation of New and Shiny (and often over-hyped) books. What better way to snap out of a reading fugue than to take a mini-vacation into the past? Nathaniel is a magician’s apprentice, taking his first lessons in the arts of magic. But when a devious hot-shot wizard named Simon Lovelace ruthlessly humiliates Nathaniel in front of his elders, Nathaniel decides to kick up his education a few notches and show Lovelace who’s boss. With revenge on his mind, he summons the powerful djinni, Bartimaeus. But summoning Bartimaeus and controlling him are two different things entirely, and when Nathaniel sends the djinni out to steal Lovelace’s greatest treasure, the Amulet of Samarkand, he finds himself caught up in a whirlwind of magical espionage, murder, and rebellion. This is another entry in a series of Old School Wednesdays posts, brought to you by the amazing folks who supported us on Kickstarter. As one reward level, backers were given the opportunity to pick an Old School title for one of us to read and review online. It starts with the summoning of one of the most powerful djinn in history, Bartimaeus. He is tasked with stealing the Amulet of Samarkand from Simon Lovelace, one of England’s greatest and most powerful magicians. Bound and controlled by the magician who summoned him (and WHO could have that kind of power? ), Bartimaeus sets out to accomplish the deed. What Bartimaeus didn’t know – and certainly did not expect – was that the magician who summoned him was a mere 12 year-old boy named Nathaniel. Nathaniel is the ambitious apprentice to a second-rate magician has a bone to pick with Lovelace after a particularly humiliating encounter. What happens next is a mix of adventure, murder and political intrigue in a revenge-gone-seriously-wrong story with alternating viewpoint chapters between Nathaniel and Bartimaeus. We come to learn about Bartimaeus’ and Nathaniel’s personal backstories which brilliantly tie in with the worldbuilding at large. The former is a powerful djinni who is at the beck and call of magicians who have no power of their own, except for the power to summon and control magical beings to do their bidding. The more powerful a magician (and his slaves are) the more political power he yields. The latter began life as an apprentice after being sold by his parents to his master when he was six years old and was brought up in a loveless relationship with his master and was emotionally and physically abused for years. The detailed worldbuilding and the background of each characters intermingle more and more as the story progresses to include a plot against the government and hiding behind the main storyline are tantalising snippets about a rebel resistance, about the conflation between magic and politics, about a world that is obviously being controlled by these amoral magicians and their propaganda. Because the story is seen mostly through Nathaniel’s restricted viewpoint, those snippets are never further developed – at least not in this first book, although I suspect they will become a larger plot in future instalments. Of specific note to me is the presence of a powerful human girl who seems to be one of the leaders of the resistance and who appears a couple of time to wonderfully thwart both Nathaniel and Bartimaeus in different occasions. In a book with a dearth of female characters, the appearance of this intriguing female character – one who doesn’t even get a proper name – without any further advance here, felt particularly frustrating. My main problem with the book though is that, for a book that deals with a lot of darkness, including emotional and physically abuse, slavery, murder and guilt, it felt woefully devoid of well, emotions. There was a sense of detachment in the writing, mirrored in any lack of detachment between the two main characters who were merely allies-for-now. With Nathaniel, this felt specially grating because he has a background that should earn our sympathy but the book is very much plot-driven and any character development falls by the wayside. SO! On one hand, there were a lot of things I appreciated about the novel: Bartimaeus’ sass, the darkness of the story, the plot itself. One the other hand, I read primarily for characters and there was a lot to be desired on that front. Should I read the sequel, dear readers? Rating: 6 – Good, recommended with reservations. I liked this series a lot when I read it (near when it came out) but the third series ruined a lot of it for me because of reasons I can’t get into since they’re big spoilers. I enjoyed Stroud’s first Lockwood and Company book much more and plan on continuing with that series once I have more free reading time. Cast spoilers for books 2 and 3: Gur tvey qrsvavgryl trgf n anzr naq cynlf n jnl ovttre cneg va yngre obbxf. In general I do think that given your if-onlys, you should definitely read on! I read thee back in 2006, but couldn’t really tell you anything about them. Looking back on my reviews though I did enjoy them, fun and light-hearted although dealing with heavy issues is pretty much how I described them. I’d almost be tempted to reread them and see how I feel now. This book was recommended to me but I did not finish it. I found it really irritating in the treatment of female characters, mostly due to inconsistencies in the world building. I don’t remember the exact details but it seemed like Bartimaeus would say one thing about djinn nature and then act another, specifically to demean women, at least that is my relatively vague memory of my reason for not finishing the book. The girl becomes a main character in the later books. Re: the narrative style, you’re either going to like it or you aren’t. I personally found Bartimaeus’s POV hilarious and Nathaniel’s subtly tragic. It definitely isn’t going to smack you in the face and tell you what you should feel but at the same time, I definitely didn’t get ‘detached’ from it. As for the relationship between Bartimaeus and Nathaniel, they;re antagonistic occasional allies by force, which is about the best you can expect imo when one is enslaving the other. But as for character development, I strongly disagree that it fell by the wayside. The narrative doesn’t shove it in your face, but every choice Nathaniel makes in the first book is clearly driven by his trauma during childhood, and how he learned to survive from observing other magicians more powerful than himself. I consider this series a 10. The first book seems firmly entrenched in the magicians’ side of things–although the first tip-off to the contrary should be that the POV character is a slave–and then we discover later that the point of the story was something else altogether. I think I read it first at the age of 14, and found that it had a lot of interesting and thoughtful things to say about colonialism, powerlessness, classism and rebellion and that was important to learn as the child of a country brutally colonised in the recent past. I’m a little biased, but I think you should read on given your reservations. The girl in question does get to be a third viewpoint character in later books, and she’s amazing. There’s also definitely further character development for both Bartimaeus and Nathaniel, and although not all of it is positive, it was- for me, at least- fascinating to watch, both because it felt real and somewhat unexpected at the same time.